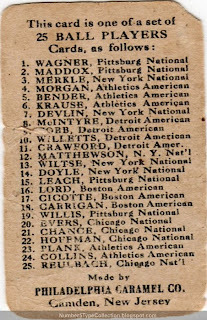 In an era steeped with tobacco, NJ-based Philadelphia Caramel produced one of baseball's earliest "candy" issues, this comparatively brief 25-card set of 1" x 2" caramel box inserts. Its hand-tinted design closely resembles the mammoth T206 cigarette set and other contemporaries, a standard card "look" for about a decade. Chief Bender's tight-brimmed hat and serious expression contrasts dramatically with today's action-based photography. 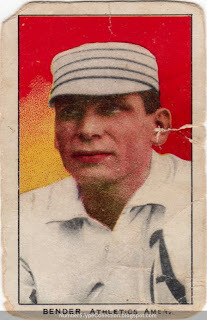 Bender, stereotyped as "Chief" for his Ojibwa heritage, pitched in Philadelphia under legendary manager Connie Mack from 1903 to 1914, winning 193 games in 12 seasons. (Full stats at Baseball-Reference.com.) After retirement, Albert served as a Philly scout and minor league manager from 1926 until 1950, when Mack himself called it quits. Value: E95s cost a lot of money, even in lower grades. As a HOFer, this poor-fair Bender ran about $60 in 2003. When the vintage market jumped a few years ago, this set followed suit. These days, most sellers ask at least $50 for commons and many times that for legends like Wagner and Cobb. Fakes / Reprints: At least one modern company reprinted this set (and perhaps more). The site Caramel-Cards.com created an excellent guide to distinguishing them from original E95s. Awesome card! And thanks for posting the original/rps guide. That must have been an nice pick up back in the day. Crazy how things fluctuate on ebay in just a few years. It really is. I had a thought to build the set when commons were $20 and the big cards cost less than four figures. These days, ouch. No longer possible!